“To Tweet or Not to Tweet,” that is the question I get from many clients trying to navigate the social media world. Twitter is not the platform for everyone, but it certainly has it’s advantages. The most intimidating aspect I see from those who have never used Twitter before is how to properly compose a tweet. It can seem a little cryptic and overwhelming at first. Once you understand the language of Twitter, you will quickly learn it’s value. 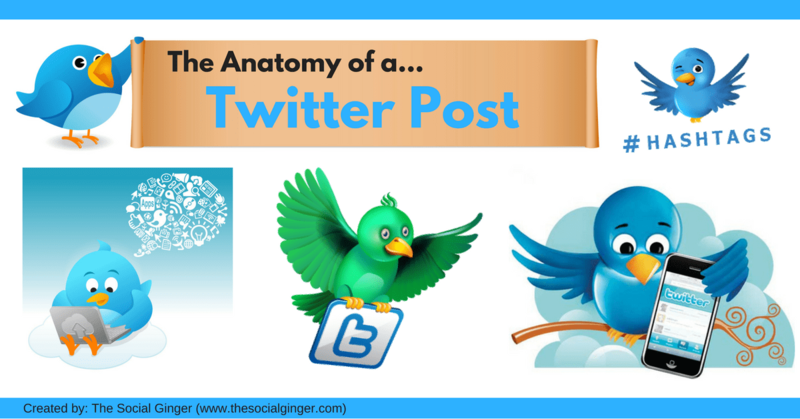 I have composed a quick lesson on the overall anatomy of a Twitter post. Once mastered, you can then begin to incorporate more strategy and begin to build your presence one tweet at a time. Your main message can not contain more than 140 characters. 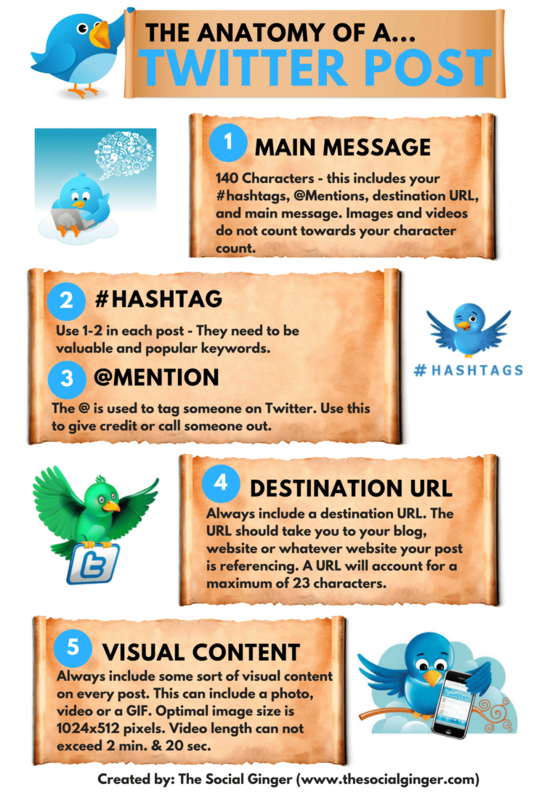 This includes your #hashtags, @mentions, destination URL, and main message. Images and videos do not count towards your character count. Make sure your message is short and to the point. The hashtags should be valuable and popular keywords. If you are looking to build your Twitter presence, I would recommend researching your hashtags ahead of time and compose your post to fit these in strategically. The @ sign is used to tag and/or call out usernames in Tweets: “Hello @socialgingerva!” People will use @username to mention you in Tweets, send you a message or link to your profile. This is a great strategy to get someone’s attention. Your goal may be to just get their attention, but this can also help to draw attention to your tweet so that maybe that individual will retweet your tweet. Always include a destination URL in your message. The URL should take you to your blog, website or whatever website your post is referencing. A URL will account for a maximum of 23 characters, or less if your link is shorter. Consider tidying up your message by using a URL shortener. A shortener will convert the regular URL into a more condensed format. Using a shorter URL will make your message more aesthetically pleasing to the eye, and can be used to help you with tracking the usage of your link. There are several options to use when deciding on a URL shortener. My personal favorites are Bitly, Goo.gl, and Hootsuite. Always include some sort of visual content on every post. Your photo size is important to consider. The recommended size is 1024 x 512 pixels. Since more often than not, most Twitter users are using the platform with a mobile device, you want to consider how your image will look to them. If it doesn’t catch their eye, they will keep on moving past your post and not even notice it.